Happy International Day against Homophobia and Transphobia (IDAHO)! The Asia Pacific Coalition on Male Sexual Health (APCOM) and the Institute of Development Studies are officially launching a co-produced discussion paper, titled “Islam, sexual diversity and access to health services”. There is also a corresponding video interview with the author, Muhsin Hendricks. Check out the video as well. The author discusses his own journey in reconciling his sexuality and his faith. Thanks Corscri Daje Tutti! [Cristiano Corsini]for the photo! 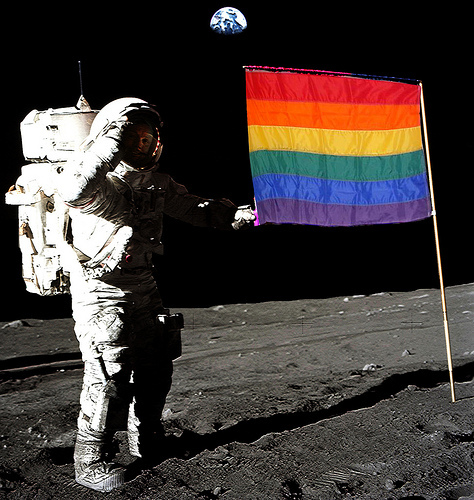 A person is wearing a spacesuit on the moon holding the LGBTQ Rainbow flat.